Most vapers choose their favourite e-cig liquid and stick to it, just as smokers usually stick to only one brand of cigarette. We are creatures of comfort after all. And if you used to smoke one brand of cigarette, it is likely that you will vape with an e-cig liquid that is most similar to that brand. However, have you ever thought about mixing it up a little bit. Literally?  Here at Fresh Mist we he have the components that you need to create your own e-cig liquid. You could create a perfect e-liquid for you, with our products. Which Components Do I Need? Within any e-cig liquid there is a percentage of nicotine, a propylene glycol or vegetable glycerine base diluting chemical and a flavouring of your choosing. All of these components are available from Fresh Mist, at a fraction of the price you would pay elsewhere. strength of the chemical that you are using. Our nicotine formula is of an MHRA standard. 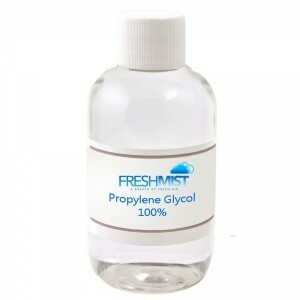 As a diluting agent for the nicotine, you should use propylene glycol and vegetable glycerine. These chemicals work to dilute the nicotine, giving you an even balance and a smooth vaping experience. 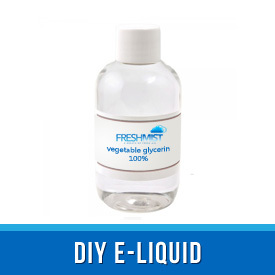 As a guide, many e-cig liquids are used with mixing 80% propylene glycol with 20% vegetable glycerine. Finally, you can choose your flavour. Or, if you’re a little bit more adventurous, you can mix some flavours to create your own personal vaping experience. If you choose to create your own e-cig liquid, you will inevitably save money. As you can buy the base and the nicotine in 500 ml. This means that instead of already mixed e-cig liquids you can create the perfect combination for you, at a smaller price. Get in touch with Fresh Mist today and order your DIY e-cig liquid now.